Jawalamukhi : The government of Himachal Pradesh is mulling starting a medical university in the state to bring health education and health science under one roof. 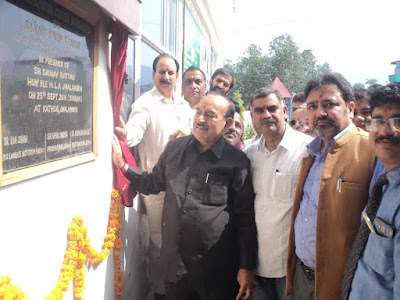 This was stated by Health Minister Kaul Singh Thakur at Kathog near Jwalamukhi after dedicating the state’s first and the country’s seventh drug information centre to the people on the occasion of Pharmacy Day. The Health Minister said a draft proposal for the medical university had been prepared and would be presented before the Cabinet for its approval. He said the DRPGMC at Tanda and the IGMC in Shimla were functioning well and the medical college in Mandi was going to start work this year. Pharmacy colleges in the government and private sectors were functioning under the technical university, which was looking conflicting so these colleges too would come under the purview of the medical university. He said expansion in the medical education sector would bail out the state in terms of scarcity of doctors in days to come. He said with the expansion in the pharma sector more job opportunities would be thrown up for pharmacists. He lauded the role of the state Council of Pharmacy for opening the drug information center. The center would not only help pharmacists but also help the common man. He warned the chemists and asked them to change their attitude towards patients. He said pharmacists were getting a license for their chemist shops, which were being run by their workers, which was unethical and illegal and action would be taken against them.